Lisa and I have known each other for awhile now. We went to Bethel Park together until we graduated high school! Then, Lisa graciously helped us by modeling for us in a Bridal Styled Shoot we worked on back in 2016! That’s when I was super excited to get a message from Lisa saying she was engaged and wanted to talk about her wedding plans! Lisa + Dalton had the right idea! They really wanted the day to be about the most important thing…marriage. They wanted a very low key, low stress, and loving atmosphere. They decided to get married with their absolute closest family and friends-about 20-30 people max! 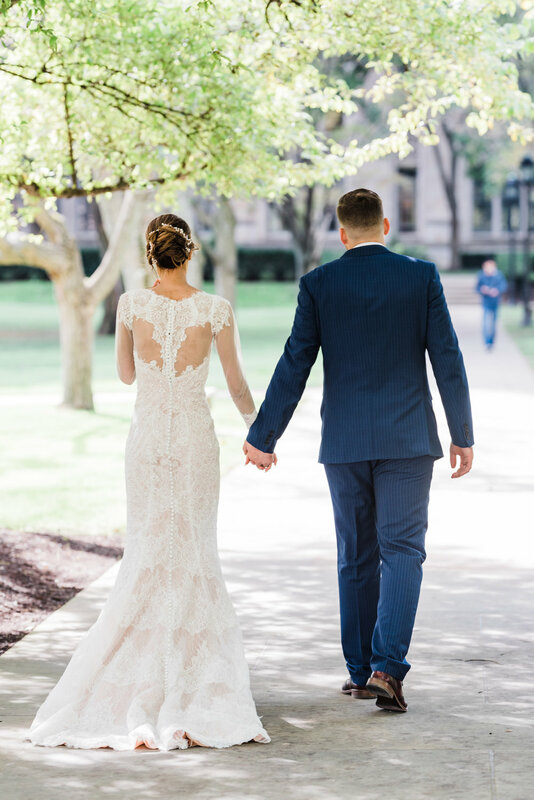 The beautiful Heinz Chapel in downtown Oakland on Pitt’s campus was the perfect spot for their romantic vows! After their ceremony, some quick family photos, and a few Heinz Chapel bridal portraits, we made our way outside for the rest of their portrait time around Pitt’s campus and even over near Phipps Conservatory! Overall, we were only with them for 2 hours, but we made every moment count! After we had concluded our time together, Lisa + Dalton had a private dinner just the two of them to celebrate! The next day, they gathered with their friends and family for a reception dinner which we could not attend, but rounded up their wedding weekend fabulously.